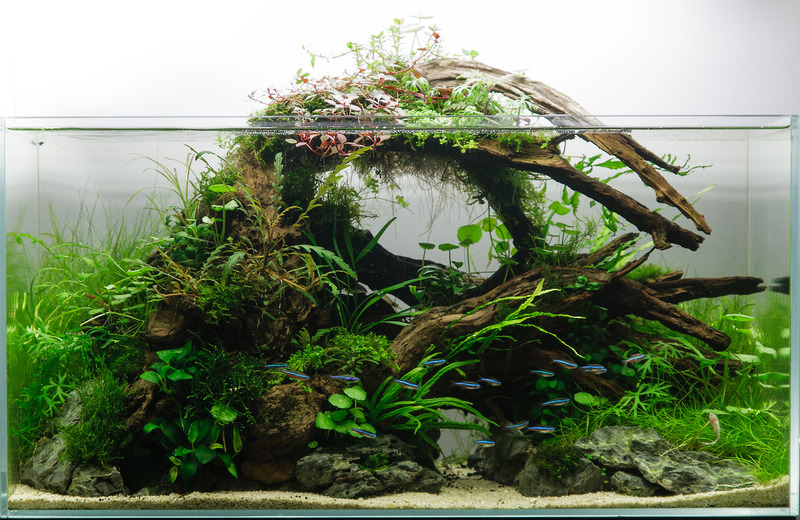 Aquascaping is the art of underwater gardening with aquatic plants, rocks, stones or wood, in an aesthetically pleasing manner within an aquarium. What makes aquascaping so hard, is that you’ll need to recreate the natural environment within (usually) a small space. Most of the time, aquascapes house fish, to help with building a natural environment, but it is possible create a aquascape with plants only. Big names in the aquascaping world are James Findley (UK), Oliver Knott (DE) and Takashi Amano (JP), who all contributed their knowledge to the aquascaping culture. There are lot of layout types of aquascaping. 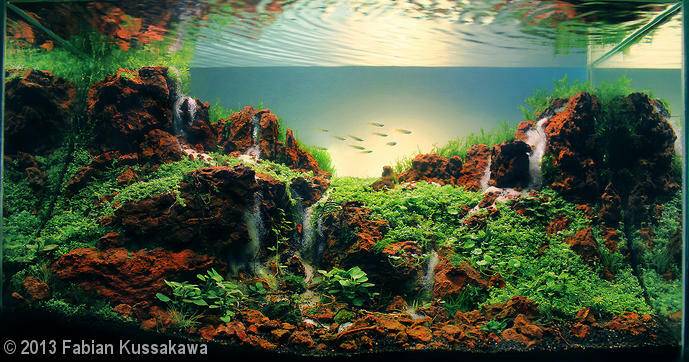 Iwagumi is a styles that originates from Japan, where stones are the backbone of the aquarium. Iwagumi typically has only a couple of plants, and around three or four type of stones: Oyaishi (primary stone or father stone), Fukuishi (secondary stone), Soeishi (tertiary stone or accompanying stone) and the Suteishi (or sacrificial stone). In a planted tank, the Suteishi stone often disappears after the plants have completely set in, but it still plays an important role in the structure of the lay-out. The Dutch style, which is originating from the Netherlands, features a wide range of plants and colours. Wood and rocks are hardly ever present or visible, but the depth, color and contrast make it a very interesting layout. The Nature style focusses on both natural landscapes and snapshots of natural environments. This lay-out is pioneered by Takashi Amano. It focusses on the design elements which are also used in Iwagumi lay-outs. 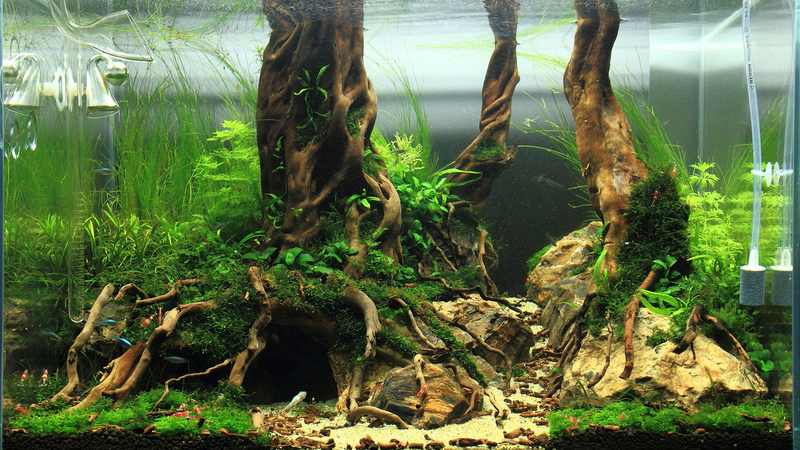 The world biggest competition is the Aquatic Plants Layout Contest (IAPLC), with applicants from all over the world. 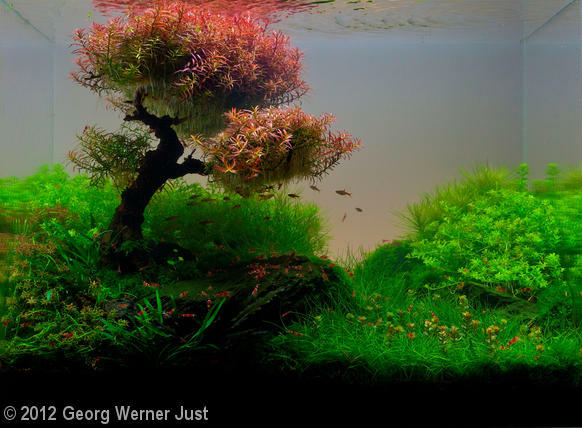 Another example of a aquascapers competition is the Aquatic Gardeners Association’s International Aquascaping Contest, which website provides information on what is in the tank and what is used to make it function. It is not easy (however not impossible), to make layouts like these. It takes a lot of planning and patience, which makes aquascaping a real form of art. Especially in the beginning, it takes a lot of searching for the right type of materials for the lay-out, finding the right plants, choosing the right fish and a lot of water changes. But once you found the correct balance in your tank, it is a really beautiful addition to your home or office. It is also a very good therapeutic activity, which allows you to play around with design rules like the golden rule. I especially think it is good for designer, illustrators and photographers like us, because you learn to look at it from a different perspective. For more insight in aquascaping, the Green Machine, a company founded by aquascaper James Findley, has very detailed and well explained videos.